More people are becoming aware of where their products come from and the importance of sustainable resources. Excessive consumerism, passing fads and the push to maximize profits at any price - drive a global market of poor-quality mass-produced jewellery. Most of these pieces are made using mass-mined metals with poor environmental controls. We only source metals from suppliers that are fully compliant with the LBMA Responsible Gold Guidance and OECD Due Diligence Guidance for the Responsible supply Chains of Minerals. Our stones are guaranteed to be conflict free and comply with both the United Nations Resolution and the The Kimberley Process Certification Scheme. Know how it is made. Did you know that a 18ct Gold handmade ring and a 18ct gold cast ring are not the same! Yes, the % of gold is the same but one will last generations, the other may only last a few years! This is because most mass-produced cast jewellery is pushed through a machine with silicone "watering" down the metal to make it run smoother. Unfortunately that means that the resulting metal is softer, more porous and will crack and wear. It will feel lighter in the hand compared to "solid" gold. Do you have jewellery that has gone out of style - or is damaged? If may be able to be re-paired or remodeled. This is also a great way to save a treasured piece and give it new life. If your jewellery is beyond repair - consider having it melted down and created into an amazing new piece. Providing your diamonds are not cracked or damaged I may be able to re-use those too. Softer gemstones are often too damaged or scratched - however we may be able to get them re-cut and bring them back to life. To find out what you need to know about having your old gold melted and made into something new check out ﻿this blog post﻿ which explains somethings to be aware of. 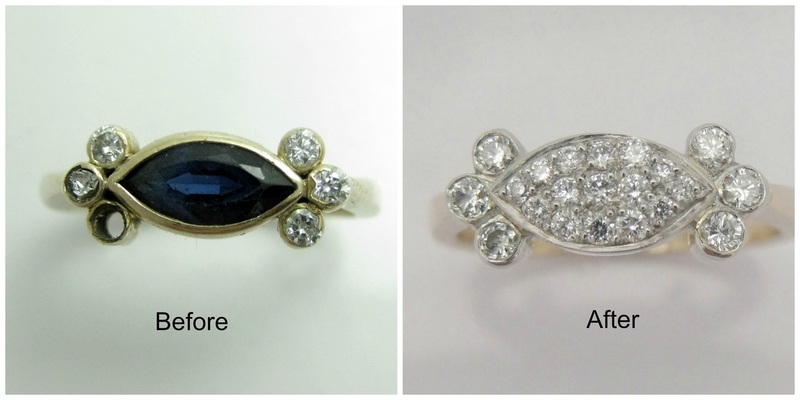 A repaired engagement ring - the ring was damaged and the owner wasn't fond of the dark center stone - however, she did not want to re-make the ring entirely as it was precious to her. This is the design I came up with and she loves her "new" ring. 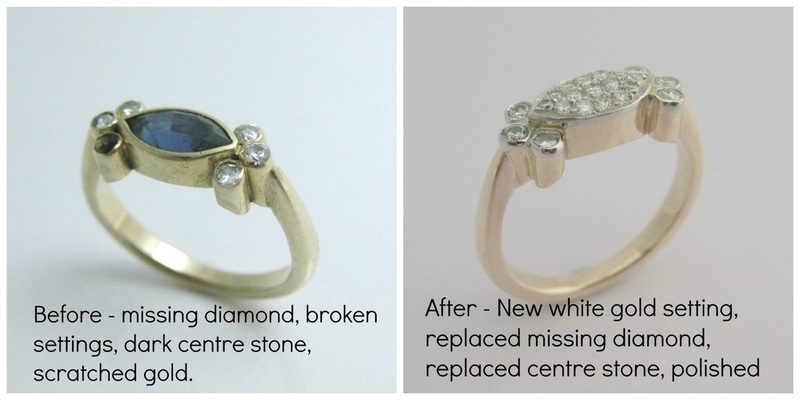 A remodeled ring from re-used diamonds and gold. After being left several old diamond rings - the client wanted to make them into something she could wear to remind her of her grandmother. Unfortunately, the rings were too thin to repair so I combined the remaining gold with new metals, and we created this ring using all the diamonds. Recycling gold and gems - by recycling old jewellery - a beautiful solid gold bangle became a wonderful Christmas present at a fraction of the cost of buying in new gold and stones.